Three weeks in the Cordilleras of Luzon and I feel like I have only scratched the surface of experiencing the rich cultures that make up the Igorot people. This is a common trend I have experienced while working on the Katutubong Filipino Project and one reason I hope to extended the project longer term, perhaps for another three years. More time is needed. This is especially true when trying to tell the story of the Igorot people who live in six different provinces with over 20 tribes all speaking different languages, practicing different rituals, and have different beliefs and cultures. Visiting the Cordilleras was like stepping into another country for me, a drastic change in geography and people’s general positive outlook and attitude toward their own way of life. Although I wasn’t able to visit all six provinces that make up the Cordilleras, this trip did provide as an excellent introduction to the area and whetted my appetite to learn and experience more on a return trip. A Butbut Kalinga Woman looking out of her window one afternoon after inviting us into her home. 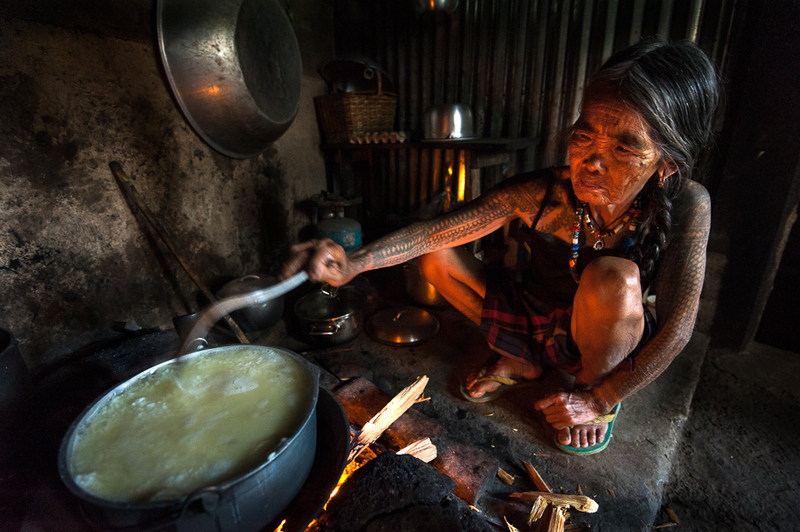 The tattoos on her arms are used as a form of beautification and identity which is specific to certain Kalinga tribes. 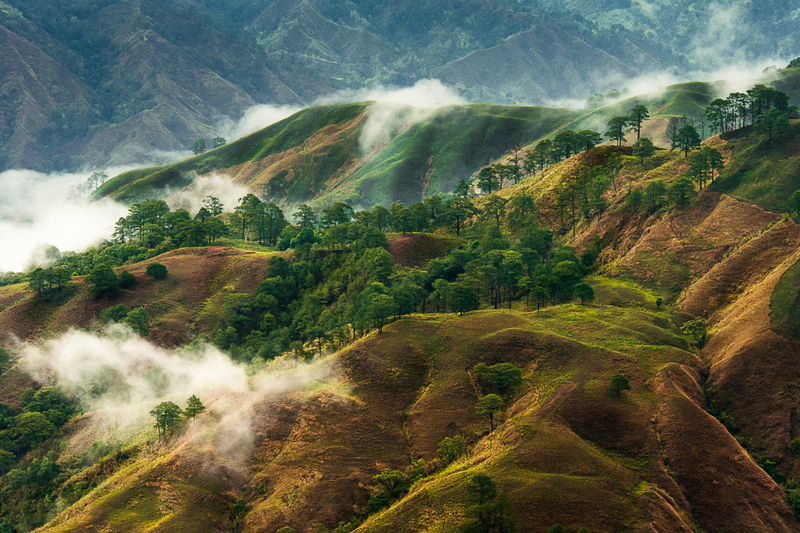 The majestic Cordillera mountains with clouds setting in, Abra Province. 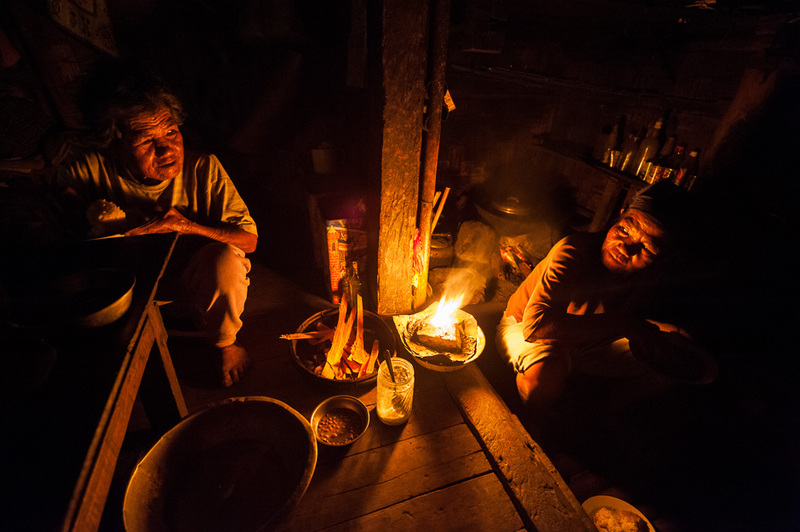 From a historical standpoint, the people of the Cordilleras were never a united people and still to this day there are peace pacts in place to keep order among many of the tribes. The term Igorot is an old Tagalog word meaning “people from the mountains” and is a general term used to include all of the mountain tribes from the Cordilleras. The Spanish adopted this term, but it was generally used in a negative manner referring to savages and backward people of the mountains. However, the Spanish themselves were never able to fully penetrate the Cordilleras during their 300 year colonial period in the Philippines and thus had very little influence on the Igorot people and their way of life. Part of this was likely due to the rugged terrain of the area but also because of the fierce nature of the people, who would not surrender easily to outsiders. It wasn’t until the early 1900’s when the American Episcopal church came into some areas of the Cordilleras and people started to convert to Christianity and get formal education. Today, the term Igorot is often debated among the people of the Cordilleras as to what the politically correct use should be. Many groups now proudly proclaim themselves as Igorots while other tribes still prefer to be called by their more specific tribal names. After three weeks in the area and hearing time and time again people referring to themselves as Igorots I never got the feeling that it is a negative term to use. I refer to the Igorot people in the most honorable and respectful manner. Portraits of Lakay Lausan a Tingguian man and Lakay Wa-aw a Kankanaey man. Lakay Lausan is one of the elders in a small village we visited in Abra province. 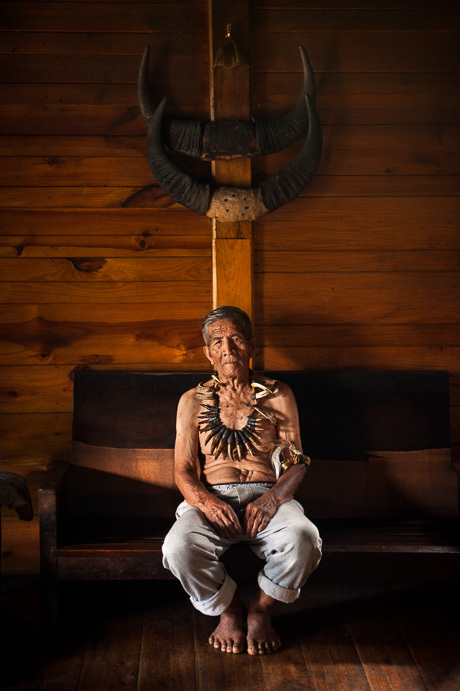 Lakay Wa-aw is one of the older Kankanaey men still around and at 92 he has nine children and over 30 grandchildren. The two water buffalo horns above him are from two of his children’s weddings. His necklace is centuries old and has been passed down from generation to generation. It is made of wild bore tusks and crocodile teeth from the Visayas. 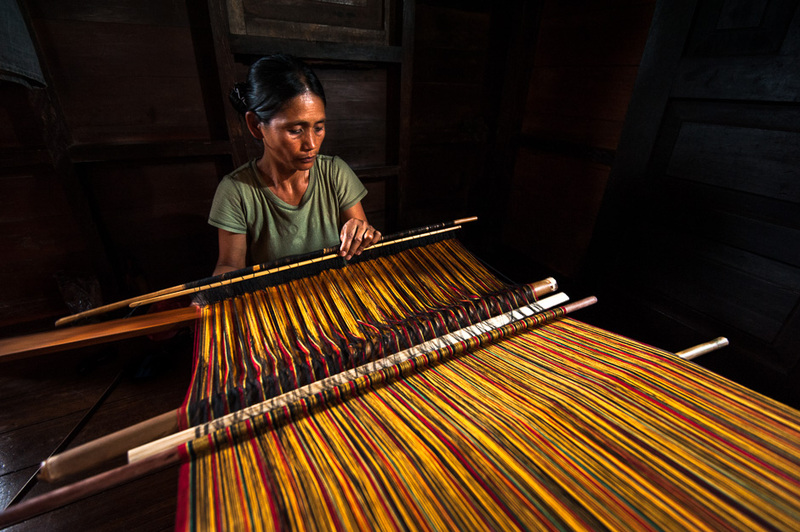 Traditional loom weaving provides livelihoods for a number of different communities within the Cordilleras. This is a Kalinga woman in her home where she spends her days making different patterns on her wooden loom. The finished products may be sold locally or sent to Baguio. One of the unique aspects of life in the Cordilleras is that the Igorot people are essentially a self-contained society running all aspects of life from businesses to politics. Unlike many of the other tribes or indigenous communities in the country who have been extremely marginalized and pushed to small pieces of their original land, the Igorot people, generally have maintained much of their land. There are always ongoing issues with regards to ancestral domain, and from what I have been told the process to actually get declared ancestral domain is almost unimaginable. However, the Igorot people have managed to maintain much of their land excluding outsiders or lowlanders from coming in and setting up shop. This has essentially allowed all development to generate from the people themselves. Allan, a well-known man from Sagada, Mountain Province, checking his beehives. He harvests the mountain honey and sells his product primarily to visitors staying at his lodging house or passing through his restaurant. All businesses in Sagada are locally owned and run by Igorot people. 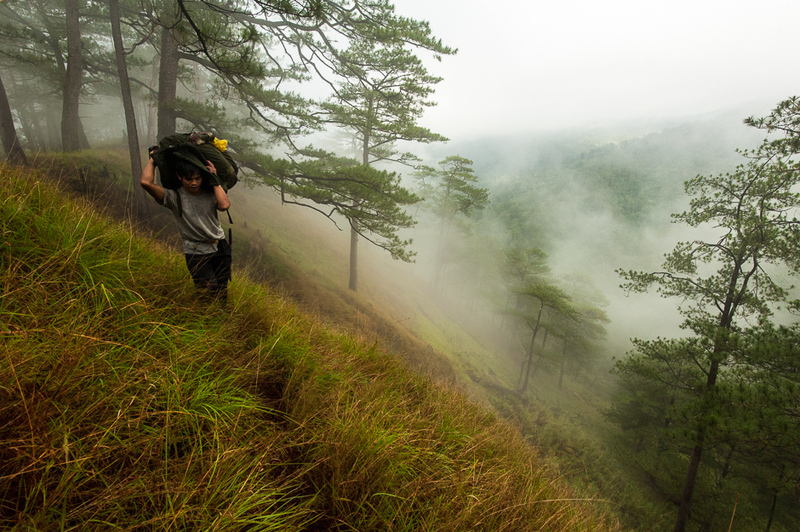 With the increase of tourism in the Cordilleras, some local and foreign tourists are looking to find more adventurous hiking treks in the extremely beautiful mountains. Sagada in the Mountain Province in particular is often overwhelmed with people visiting that there are not enough rooms for visitors, especially during holidays. I had to sleep with the cook from the lodging house I was staying for one evening because all the rooms were full with a large tour group. However, most visitors only stay for a couple of days exploring the caves and other attractions closer to Sagada. 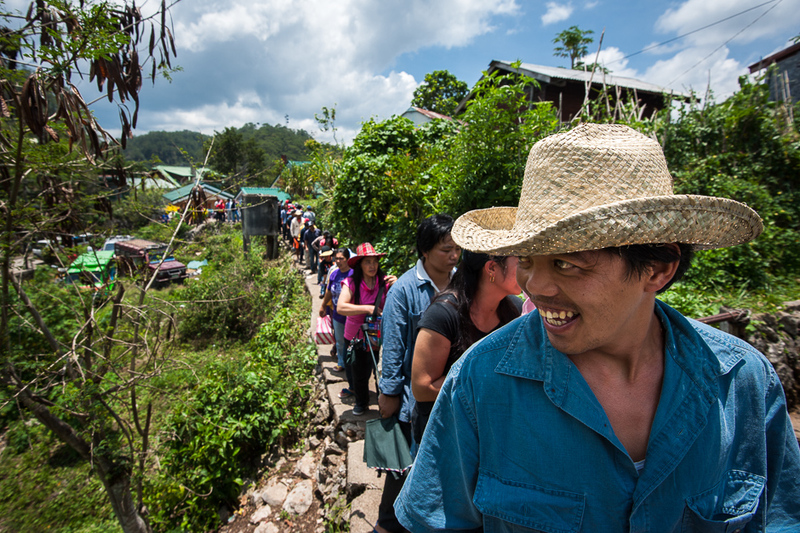 Local guides and porters (such as shown in this photo) rely on tourism and are very knowledgeable about the area. Local tourists from Manila watch as Siegrid from Sagada Pottery shows them how to create a clay jar. All the clay used here is local and Siegrid is very passionate about her artwork. 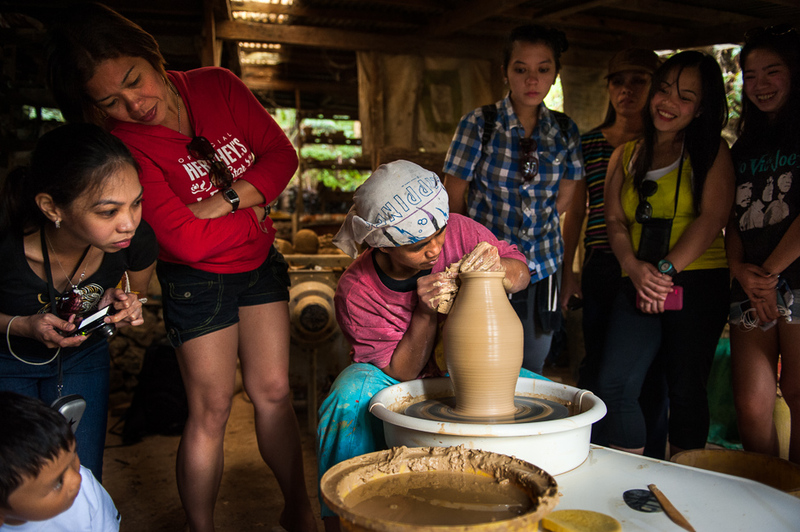 Sagada Pottery is one of many businesses/products people visiting the area come to see. Seeing life in Sagada and other city centers in the Cordilleras being completely run and shaped by locals was really very inspiring to see. I can’t think of another place off hand where this same type of system is in place. It shouldn’t be a surprise though seeing that the Igorot people were able to keep the Spanish away for over 300 years. In more recent times, they were also able to rise up and keep President Marcos from building a huge dam on the Chico River in the late 70’s and early 80’s. If the damn had been built it would have displaced a large number of communities and their rice fields. The people were able to join forces with the communist rebels and stop the damn from being built. Today, there is a plan to put a number of windmills around Sagada and the people are highly skeptical of the plan and the feasibility behind it. I don’t think the plans will push through because the people will not allow it too, one way or the other. It’s cases like this that show the true resolve of the people and how maintaining what is theirs is of vital importance to them. Away from the city centers life is a little more slow pace with a big portion of time spent farming, preparing food, and tending to the house and family. I was fortunate enough to visit a number of different communities on this trip including one that took two days of rugged hiking to reach. The hike through the mountains was one of the hardest hikes I have done in recent memory, but was worth every step being able to experience mountain life and a community still very much isolated in terms of distance. 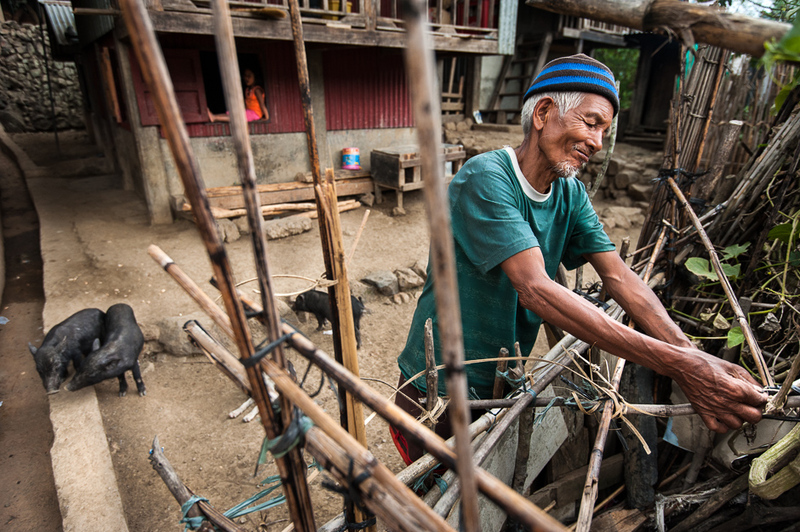 A Kalinga man fixing his pig pen, Kalinga Province. 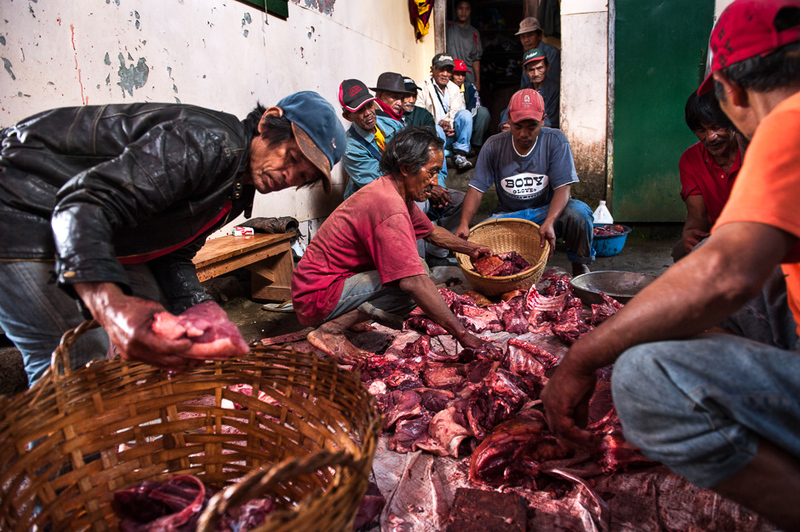 Pigs are an important part of life in the Cordilleras, providing a food source and used for a number of different rituals as well. In some communities I think there were more pigs walking around than people. 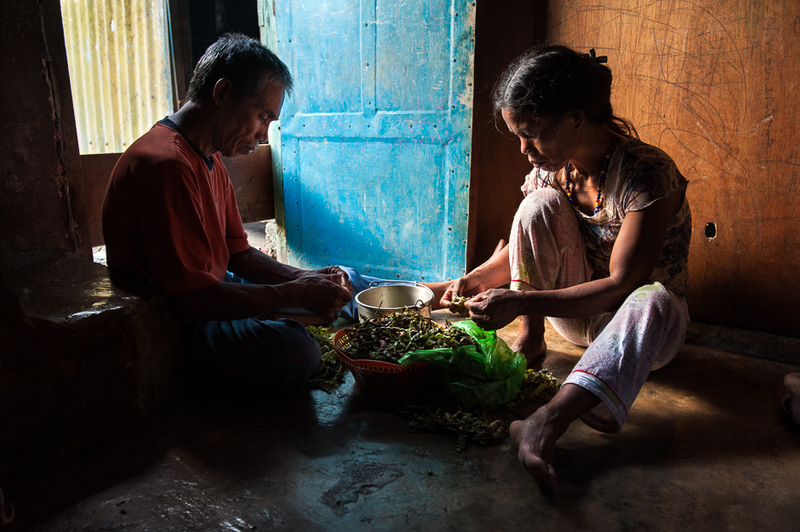 A Kalinga couple preparing beans for dinner in their home, Kalinga Province. Eating and socializing is an important time each day for people to talk and build relationships. After eating the men will generally have a few drinks together and the women will continue cleaning up after the meal. 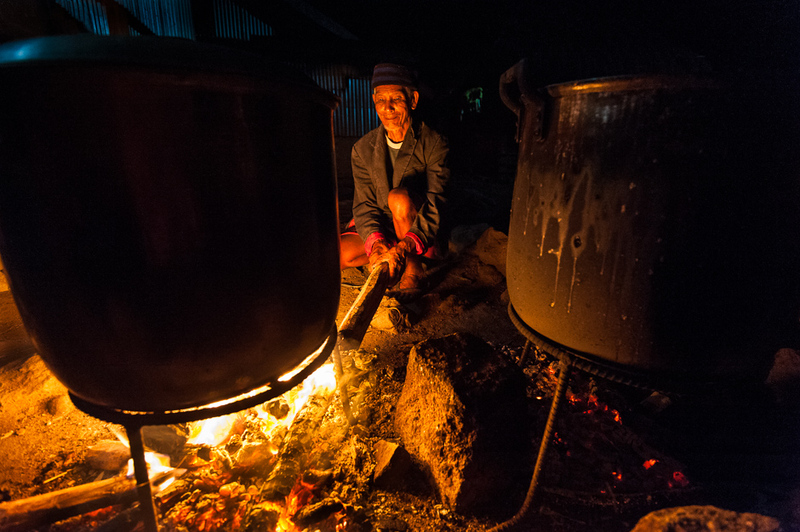 Most of our meals were cooked over an open fire and pitch pine (an oily part of the pine tree) is used for light at night instead of kerosene lamps. My most memorable meal on this trip consisted of wild mushroom soup, fresh green ferns, freshly picked avocados, green mangoes with hot pepper salt, and mongo bean and pork soup. 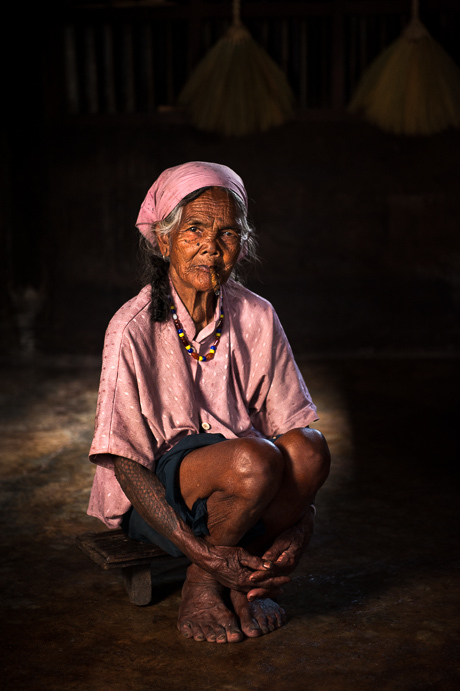 Portrait of a Tingguian woman having a smoke in her home, Abra Province. 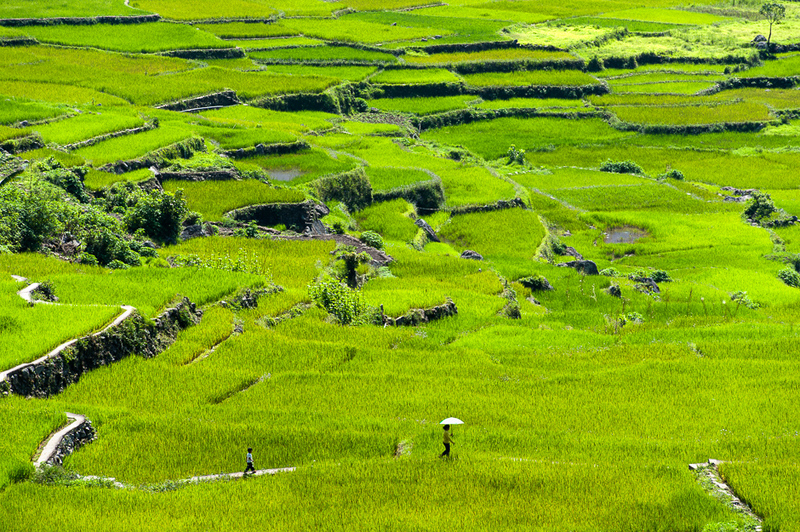 Much of the culture and life in the Cordilleras revolves around rice. From planting to harvest each period represents a time that is honored and sacred in its own way. My trip happened to be during a growing period and I was not able to see a lot of people planting or harvesting rice. There is always some activity though as weeding, keeping birds away, drying harvested rice and other tasks are ongoing. 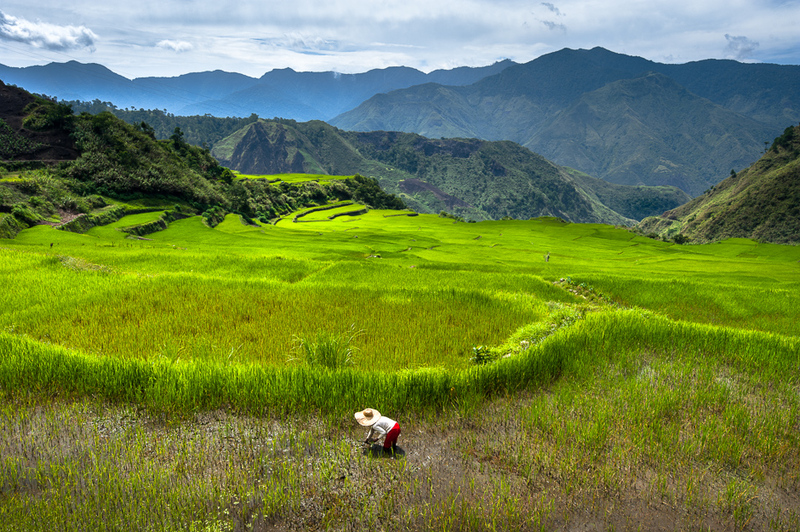 Rice is the staple crop for the Igorots and they have built some of the biggest and most advance rice terraces in the world. Traveling through the Cordilleras you will see some amazing terraces that have been around for millennium. To this day many of the tribes still practice thanksgiving rituals before planting and at harvest time. The Begnas ritual for the Kankanaey and the Bumayah for the Ifugao people are two examples of this. These rituals are usually put together very fast and are never scheduled, so witnessing one takes some patience and timing. Perhaps on my next visit I will be able to witness one. 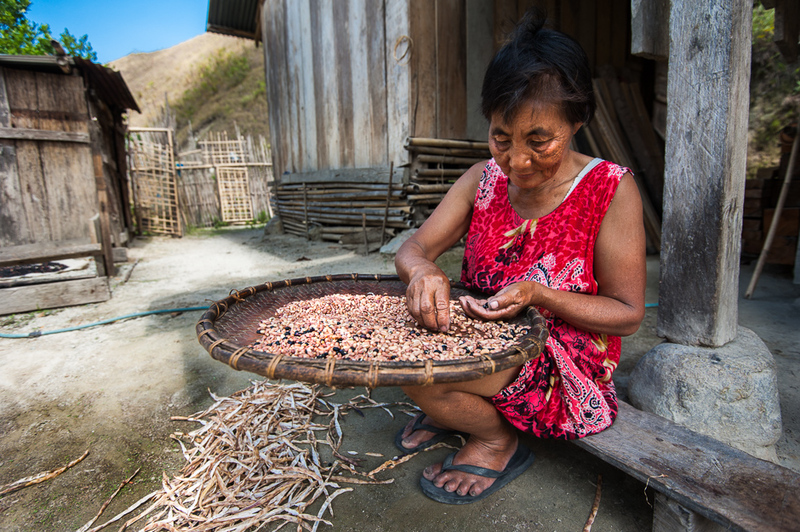 Although uncommon for this time of year, I came across a woman planting rice one morning in Kalinga Province. Stoned rice terraces are very common in the Cordilleras and represent an ancient and sustainable system for communal rice production. 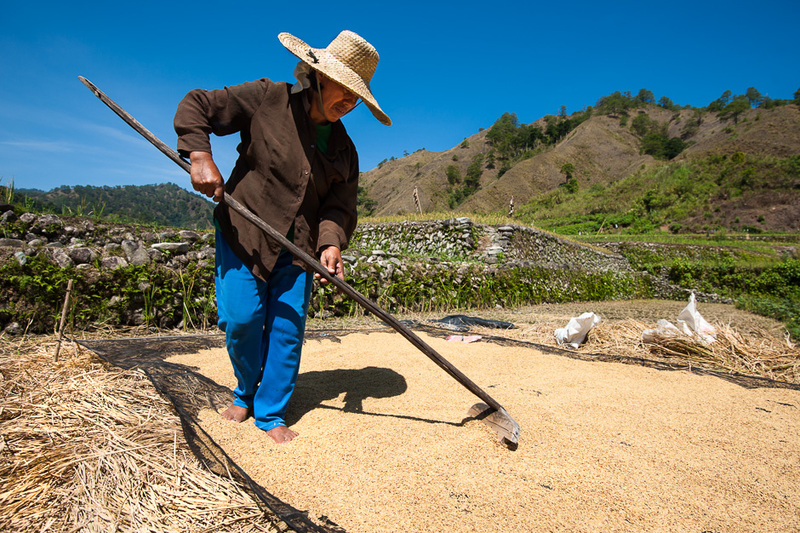 Drying rice in the sun is the most traditional method for reducing moisture content and the only method available in most remote locations. 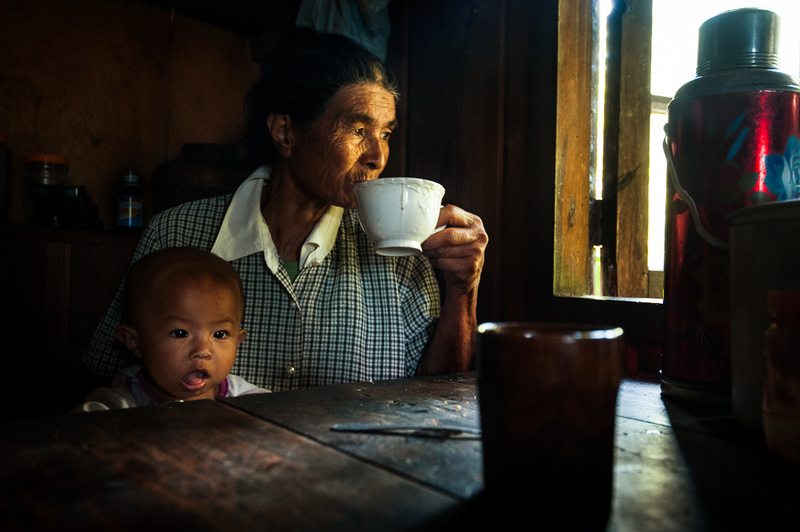 A Kankanaey woman having coffee with her grandchild during a mid-day break from working in the rice field. Aside from rice cultivation there are numerous agricultural products grown in the Cordilleras because of the altitude and cool temperature. Coffee is a popular product and most households drink a good amount of the stuff. It wasn’t uncommon to have about 10 cups of coffee a day, but it sure beats the instant coffee I usually drink when out in the field. Vegetables and other produce are grown in abundance and many of them are brought to the lowlands to be sold. 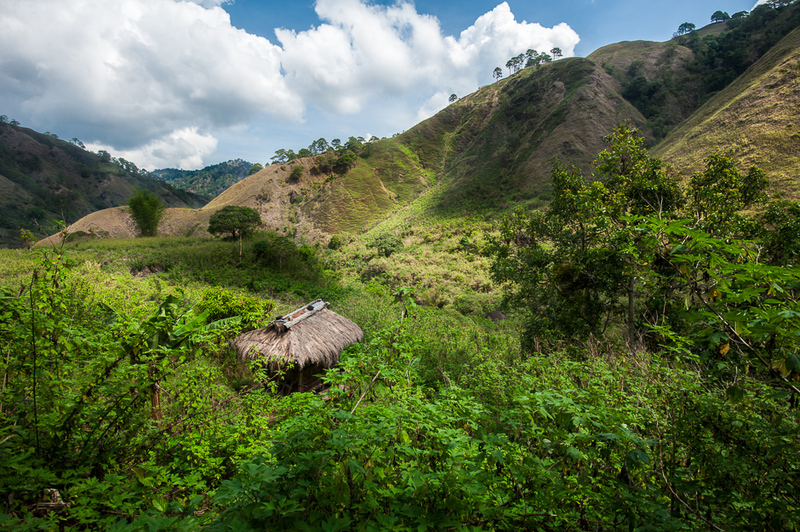 Likewise, the forest and mountains themselves are also an important resource for the Igorot people. 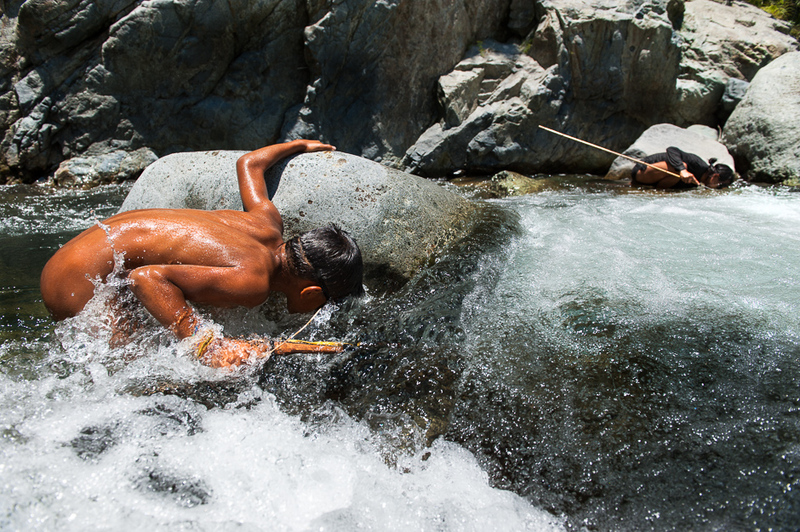 Hunting and fishing are important parts of culture in the Cordilleras and is often learned at at early age. During my long trek into the mountains I was able to experience a little of this life myself. The Cordilleras have an unique assortment of habitats that cover the mountains. While hiking you can find yourself in a dry pine forest one minute and then a kilometer down the path entering a wet mossy forest. Eventually you will run into a grassy mountain top or some rices terraces along the way as well. 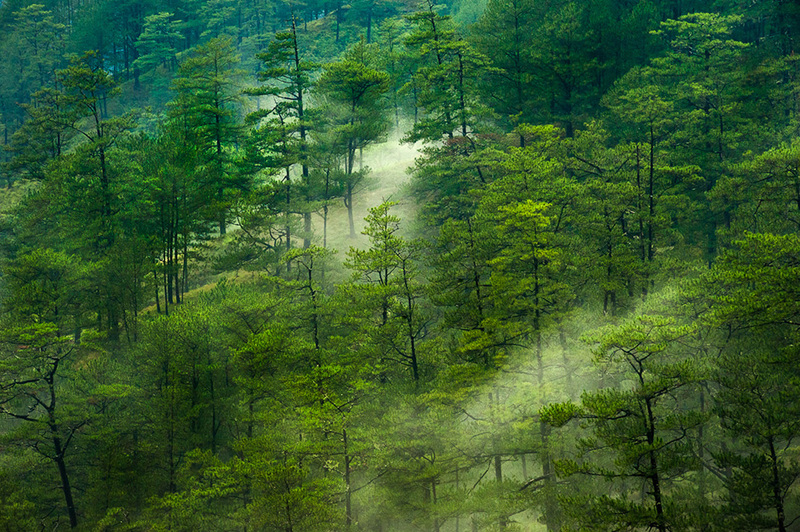 This is a pine forest just after a light rain came down in Abra province. 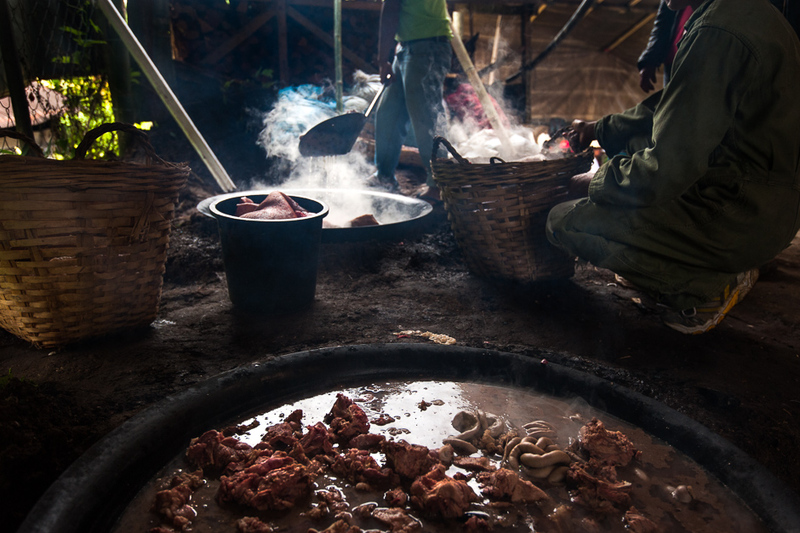 The forest still provides an abundant source of wild meat for many families. Wild pigs, deer and birds are still commonly caught by hunters. We spent a couple of nights in the forest at different hunter camps and even ran into a wild pig while hiking (unfortunately my guide did not have a gun on him). 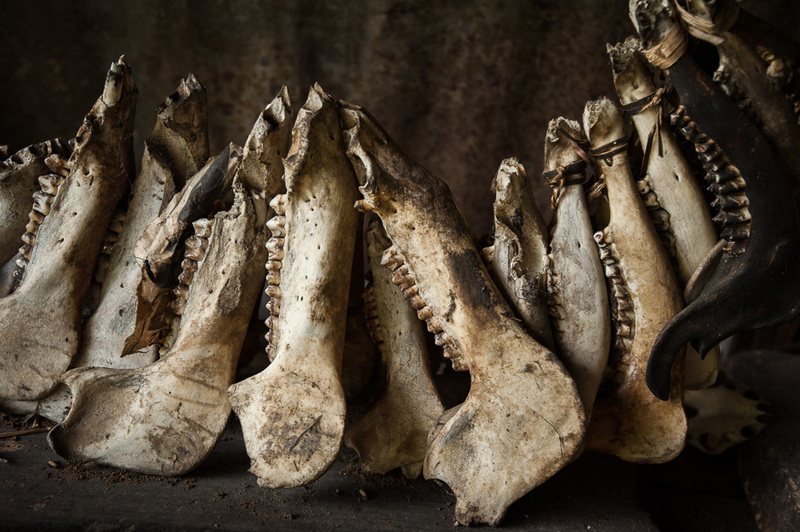 Here is a collection of wild pig skulls all caught by La-aw who is shown in one of the picture below. Two Tingguian men. Marlon is an expert fisherman and La-aw is a mountain man with a lifetime of hunting experience. Wild mushrooms like this one are abundant in the forest, especially the morning after a heavy rain. My guide was constantly picking different varieties for our meals. 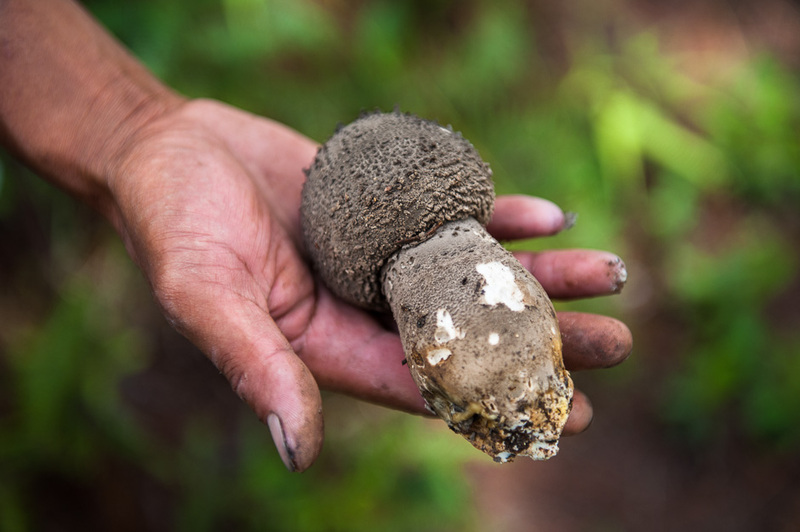 The forest is full of different food from mushrooms to wild berries and edible ants. Hunting dogs are an important part of getting wild pig, deer and birds. Without a trained dog it would be very difficult to find anything. 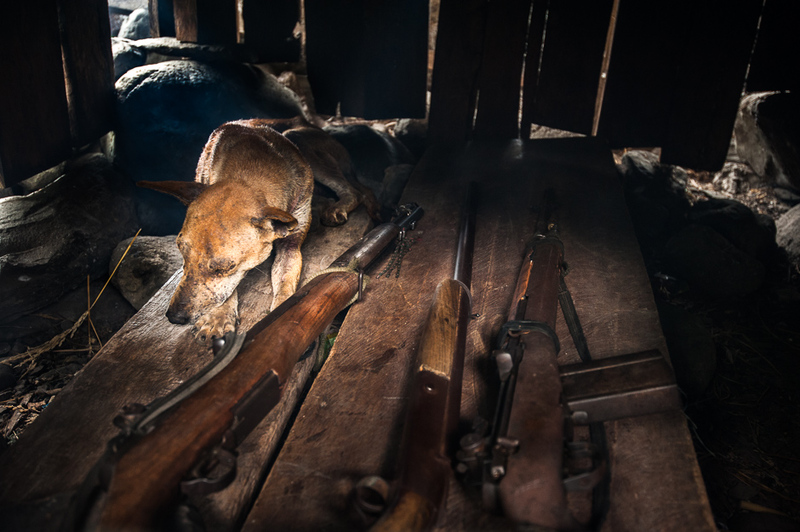 These particular guns are owned by a few young hunters we came across in the forest. We ended up hiking with them for awhile and one of their guns misfired while walking. Fortunately, no one was hurt but it was a scary situation and everyone was very lucky. I was behind them about 50 meters on the trail when I heard the gun go off. When we got to the top of the mountain we had them unload all of their guns. Marlon and a young boy from his village looking for fish in the river. Children start to learn how to fish and hunt at an early age. Here they are using a small spear style gun to catch the river fish which are fairly small. A young fisherman coming back from the river with his catch, Abra Province. 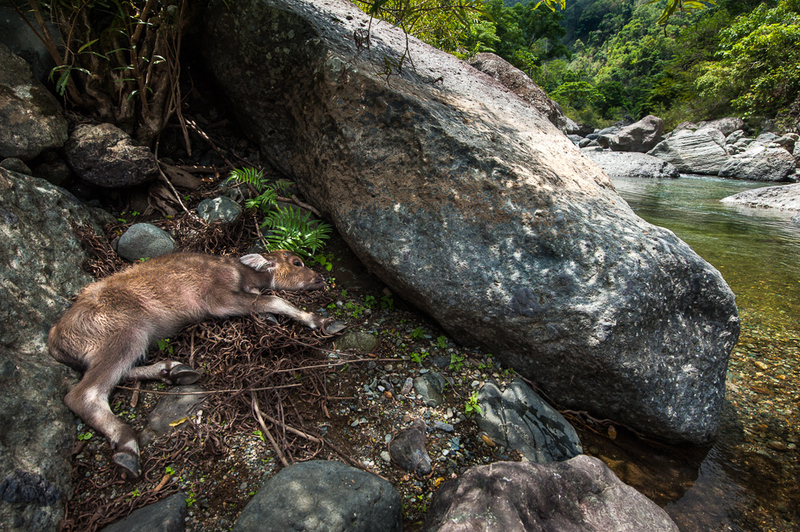 A dying baby carabao on the side of a river. After meeting La-aw we were told that one of his carabaos had been shoot and left to die a day earlier. La-aw hikes for 9 hours to reach the place where he lets his carabos graze for food in the mountains and he was very upset this had happened. The carabao that was killed had a baby which was left by the side of the river to die as well. It would take La-aw two days to hike back to his home and buy milk to try and save the baby carabao and by that time it would have died already. It’s unusual for someone to kill a carabao like this, especially to just leave it there and not take the meat. La-aw was upset and was trying to understand who might have done this. An abandon village in the mountains of Abra. We slept in this abandon village one night with La-aw, who used to live here in the 80’s. During that time the Philippine military came to this village and slaughtered most of the people living there, “like chickens,” said La-aw. La-aw was able to escape when this happened and the village has been abandon ever since. His brother was one of the innocent killed. The military still to this day has clashes with the communist rebels who stay in the mountains and during this incident they accused all the of civilians of being rebels. There is a lot of history in the area and this is only one of the many crazy stories I was told regarding the military and rebels. My visit happened to fall during summer time which is one of the wedding seasons in the Cordilleras. Wedding season really means there are a lot of weddings to attend. I thought it may be hard to find one to document, but the day I arrived there was one being prepared for that I was able to visit. The following weekend there were two more. 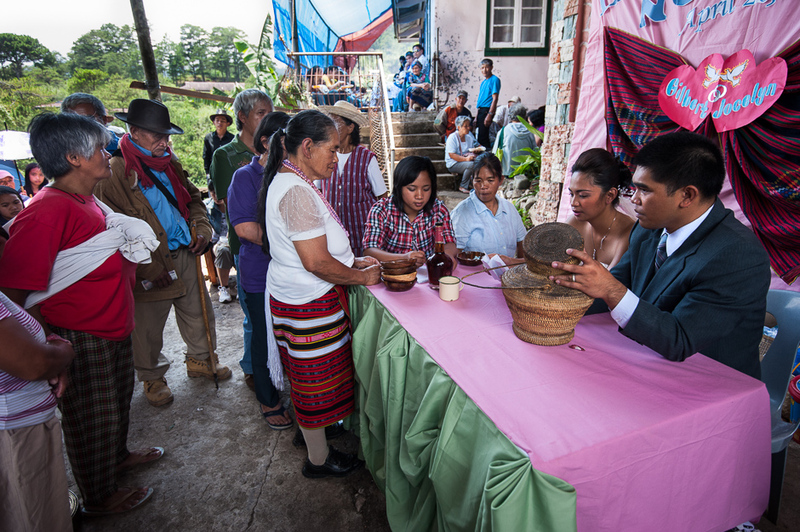 Most of the traditional wedding celebrations in the Cordilleras now integrate a Christian church ceremony as well as the tribal ceremony and rituals. Most traditional weddings last for two to three days and everyone in the community is invited to attend and eat. I have never seen so many pigs killed before all at one time in preparation for an event. 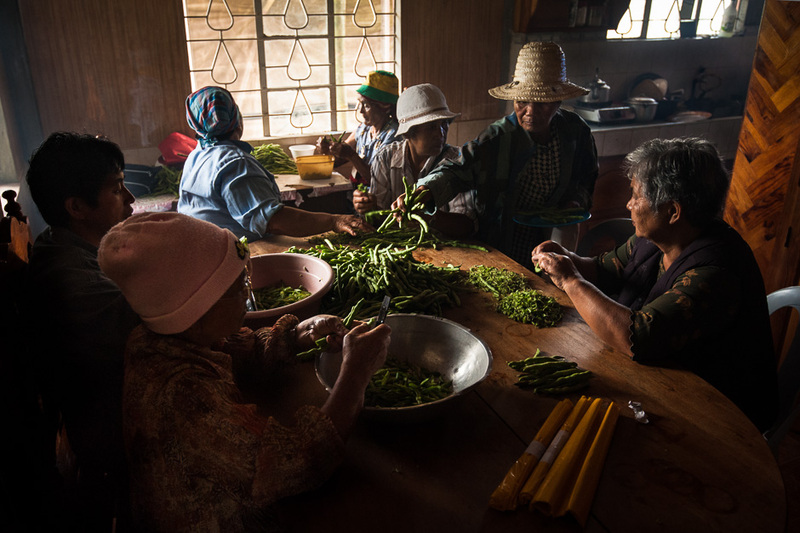 Kankanaey women cutting and preparing vegetables for a traditional wedding. The whole community is invited to the three day celebration which means a lot of food must be prepared. Men distributing meat to all of the people who helped cook and prepare the wedding food. As a token for their help different size chunks of meat are given out depending on what the persons role was during the preparation (in addition to being fed). I was even given two bags of meat for being there, apparently photographers have an important role as well. I saw more than 20 pigs killed and a carabao (water buffalo) just to give you an idea of the amount of food being prepared and I wasn’t there the whole time. 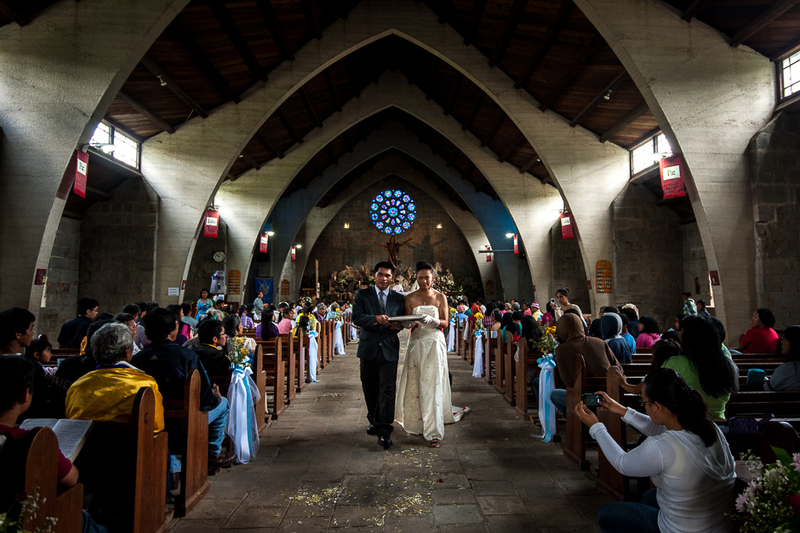 Many couples now also have a church ceremony as did the couple for this wedding. The ceremony at the Episcopal church was like any other church wedding with all of the traditional tribal aspects happening before or after this ceremony. Each community has different traditional ways of making two people united which are still practiced. Much of this has to do with uniting two families or clans together over time and involves a variety of different food exchanges, animal sacrifices and rituals. For example, I heard that in one particular community (as a final step to unite families) when a woman sleeps over at her mans family’s house and does the dishes in the morning it means the couple is officially married. People waiting in a long line to visit the home of the bride during lunch time. Everyone from the community is invited to come and get food at the brides home for three days straight. Wedding gatherings are some of the bigger social events held for the Igorot people. All of the food is cooked in large woks over an open fire. This wedding had four woks which were always full of different recipes being cooked. Part of the practice for the Kankanaey is that all the guests who come and partake in the celebration and eat should give a small amount of money to the couple. Once you give something your name is written down in a notebook, your money placed in a large basket and you are given a token of appreciation. This couple was giving out small wooden bowls as their token. 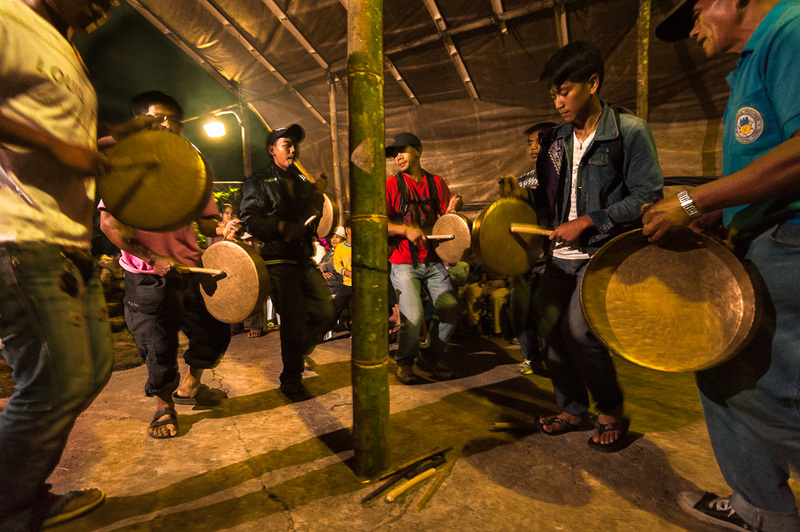 Playing of gongs (Ganza) and dancing is a fun and typical part of the wedding celebration. Any group of people can pick up the gongs and get a dance going and it is all very spontaneous. The elders all they way to the youth enjoy playing the gongs and dancing. 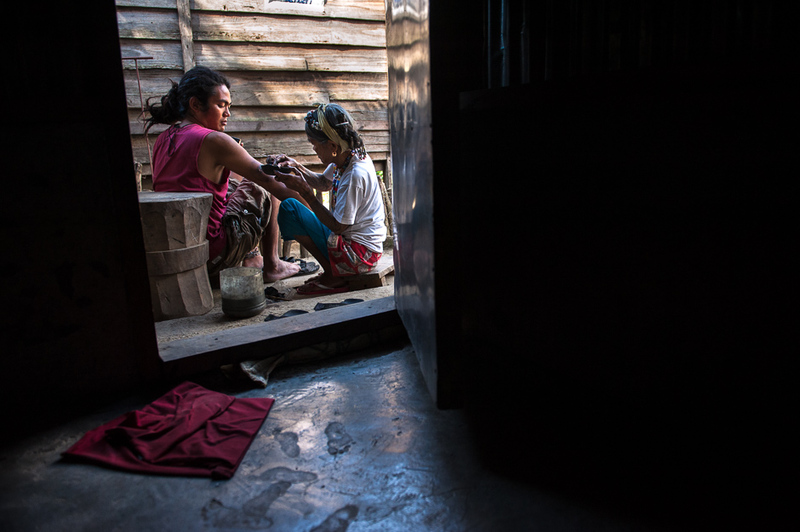 In the village of Buscalan, Kalinga there are still remnants of the one thousand year old ancient art of tattooing (batek) once commonly practiced in Kalinga. Men traditionally got tattooed as a rite of being a warrior or taking a head which was fairly common place up until the time of about WWII. Thus, it is difficult to find men who still have tattoos and younger men don’t especially feel right about getting one to show their identity (because of the meaning it carries). Women on the other hand would get tattoos to beautify themselves, but more so to signify acceptance and the different stages of their life. There are a number of research articles online describing in-depth the meaning of these tattoos and the purposes for getting them if you are interested in learning more. 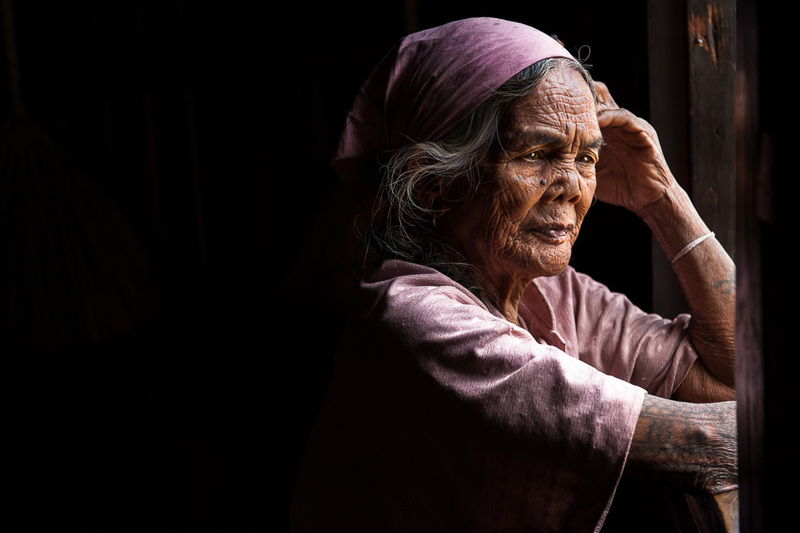 Today, there are still numerous older women in Buscalan that can be found with the tattoos. 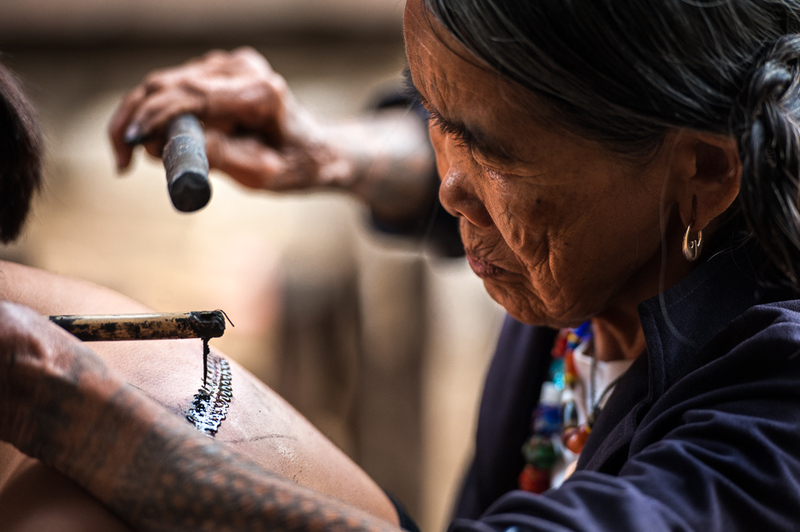 The art is slowly fading away, but Fang-od (Whang Od), the last remaining traditional Kalinga tattoo artist has helped bring a lot of attention back to the craft. At 93 years old Fang-od is a lively and very entertaining person who has the energy level of about a 50 year old. In 2010 she was featured on the Discovery Channel television show “Tattoo Hunter” which helped set the stage for other shows and documentaries all bringing a lot of recognition to the art. This sparked a huge amount of interest and today people from all over the Philippines and the world come to visit her and get a tattoo. Fang-od does not have any children, but one of her nieces is now starting to learn the craft. It’s hard to know what will happen after Fang-od passes on, but hopefully the traditional tattooing will somehow continue. Two tattooed women from Buscalan, Kalinga. Ghan-nao, who is Fang-od’s younger sister is on the left and has one of the more elaborate tattoos that can be seen in the village. Fang-od giving a tattoo to a local tourist from Manila. She uses a thorn from a pomelo tree which is attached to a piece of bamboo. The bamboo that the thorn is attached to is then hit with a piece of wood to drive the ink into the skin. The ink she uses is the soot that collects on the bottom of the cooking pans she uses at home. Another local tourist getting a tattoo from Fang-od. 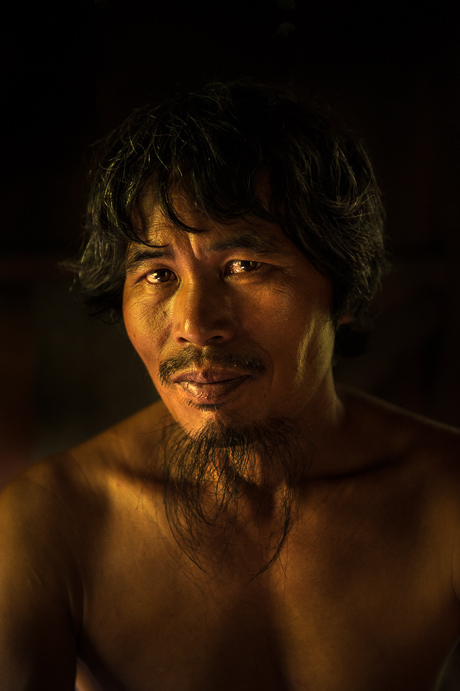 I was in Buscalan for four days and Fang-od gave tattoos each day I was there. One day she gave six of them. Everyday new visitors would arrive to have some of her art placed on their body. Fang-od cooking breakfast in her home. I wanted to show her doing something with fire as that is really her element. It’s fire that allows her to make the soot used to create her tattoos and cooking is something I saw her doing everyday as well. 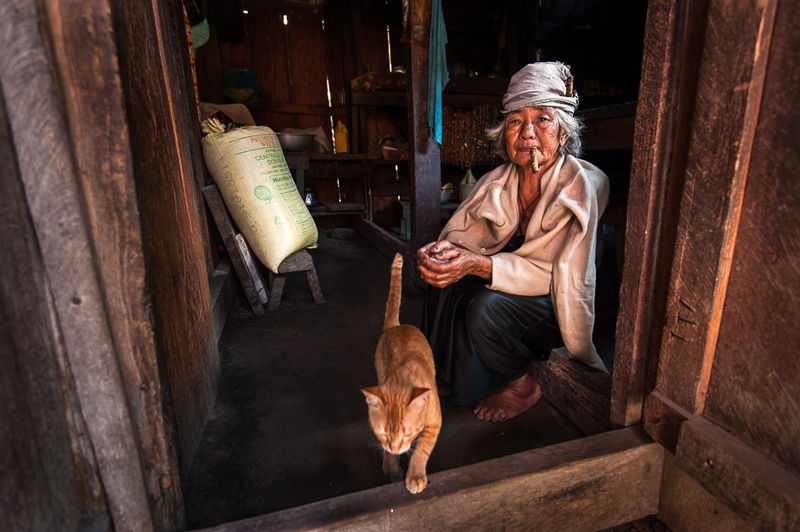 A blind Kalina woman in front of her home. 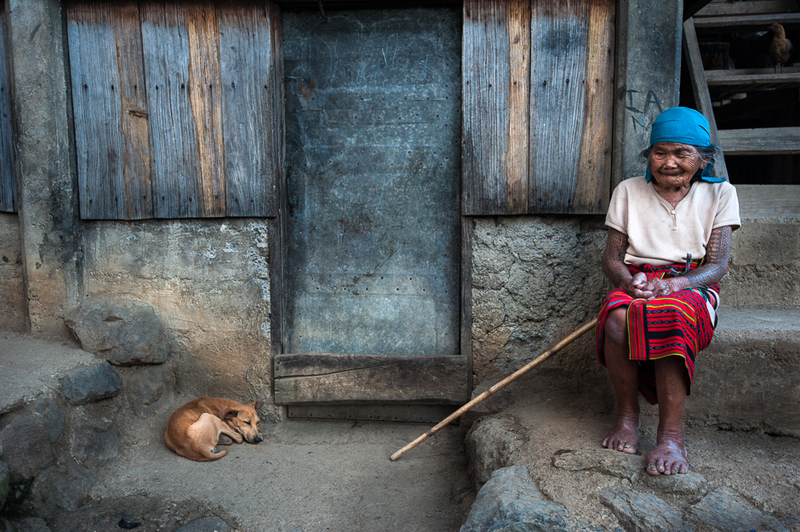 Most of the older women in Buscalan have been tattooed. 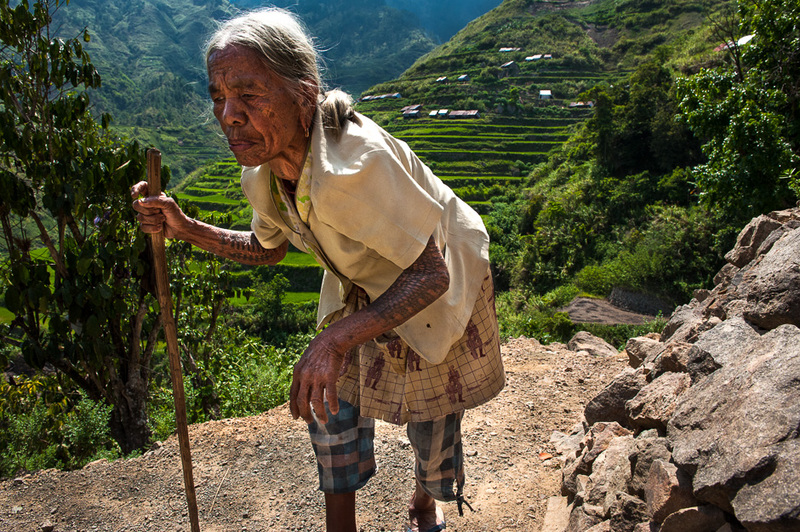 A Butbut Kalinga woman walking back to her home, Buscalan, Kalinga. My short visit to the Cordilleras was filled with memorable moments highlighted by the people I was able to meet along the way. My guides became friends and the communities where I stayed became familiar places. Although three weeks is not nearly enough time to see six provinces and experience the depth of cultures in the Cordilleras it was certainly one of my more memorable trips. Part of that was because I had new experiences with hiking in the mountains and pushed myself to physical extremes. Another part was because the people were so welcoming and open to sharing their ideas and thoughts with me. A lot of my time was spent waiting and hanging out in different communities, something that I have become very comfortable and patient with over the course of doing this project. I am someone who really likes to be on the move and get things done and it’s always refreshing to spend some time in a place where I can reverse that a little. I am hopeful that the Katutubong Filipino Project will be able to continue as I will be focusing now on finding more funding sources to extend this well received project. For those of you who follow the progress of the project I will be doing an update soon about what’s next and future happens that are currently in the works. Stayed tuned. 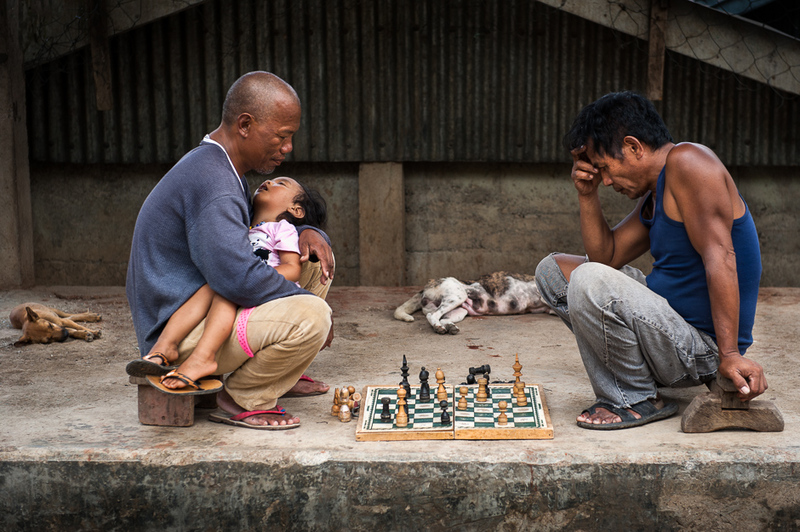 Men playing chess one afternoon in Buscalan, Kalinga. 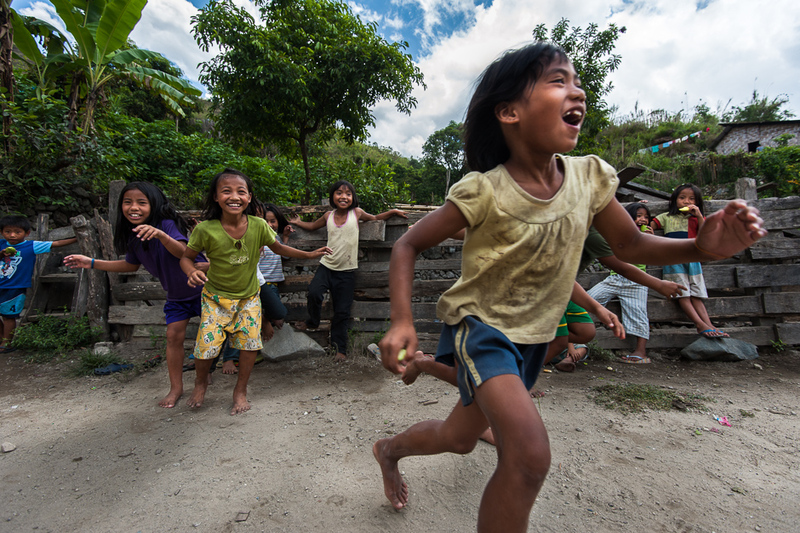 Tingguian children playing games in one of the villages I stayed, Abra Province. An elder cooking for a sponsored political event. The election is now over, but during my trip campaigning and politics even reached remote locations. Candidates will come into a community and sponsor a pig or two which is cooked for the entire community. I ended up talking with this woman for some time one afternoon while she was sorting beans. Simple interactions like this one are some of the most memorable for me. 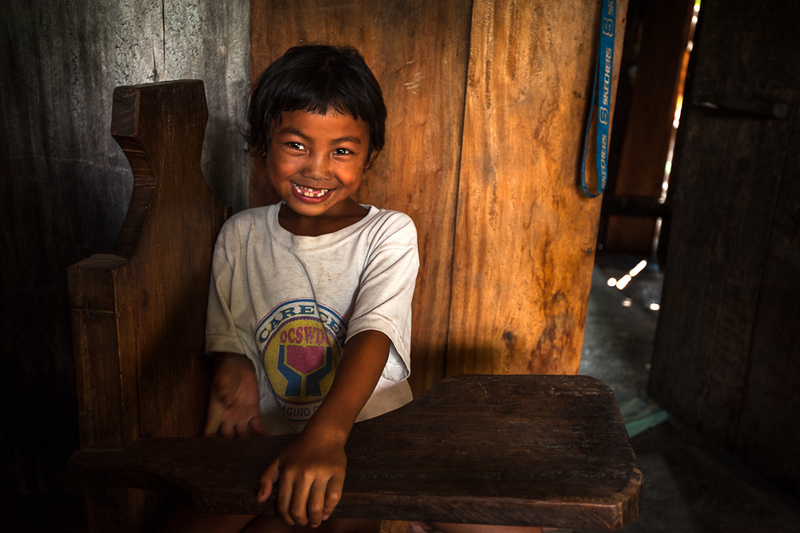 Portrait of a Tingguian child in her home. I don’t usually post photos of smiling children, but this one I could not pass up. Her smile just radiates. Some of the many rice terraces seen in the Cordilleras. Even if it is not planting or harvest season there seems to always be some activity happening in the terraces. 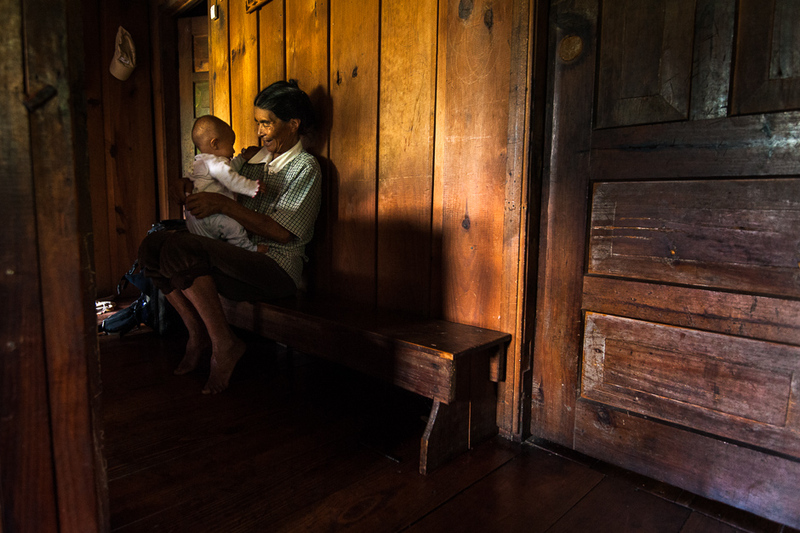 Another image of an Igorot woman with her grandchild while taking a break from working in the fields. I read this article and found it very interesting, thought it might be something for you. 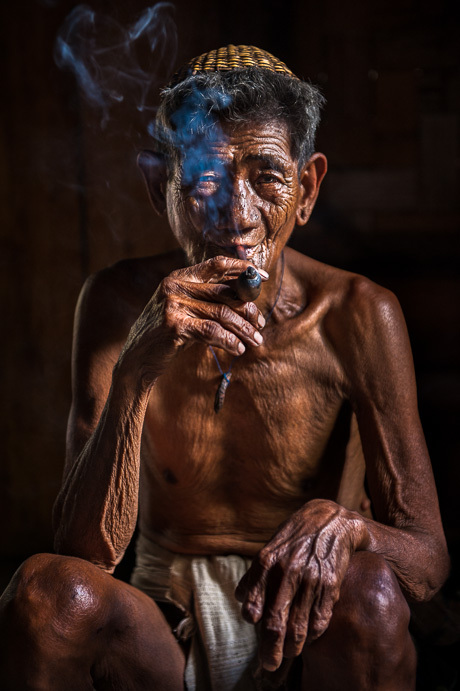 The article is called People of the Mountains – Igorots of the Cordilleras and is located at http://www.jacobimages.com/2013/05/igorots-cordilleras. email: [email protected] | Copyright © 2019 Jacob Maentz. Would you like to know when new stories are published here? All I need is your name and email. Don't worry, I wont share your info with anyone.